Inky Fingers, the wordly event series I run, is proud to announce the first of our expanded series of events for people who love words: in collaboration with DIY collaborative art project This Collection, we’re running a series of workshops at Tollcross Community Centre in writing and performing poetry. Both workshops are free and open to all — which is how both Inky Fingers and This Collection like to do things — though donations will be expected. No matter what your level of experience, if you want to write and/or perform, these workshops are for you; you just need to sign up in advance and bring some of your works. This Collection are running three months of collaborative art and performance events in collaboration with the Adult Learning Project and Edinburgh-based arts groups, so check out the full schedule for January for more exciting opportunity, and keep watching the This Collection site. This is just the beginning of Inky Fingers’ expanded range of events — brought to you by a bigger and more ambitious organising group. Expect more announcements over the next few weeks (we’d advise you to keep Feb 14th free, for example . . . ), and if you want to be part of making Inky Fingers an even better organisation for writers and performs, then get in touch. 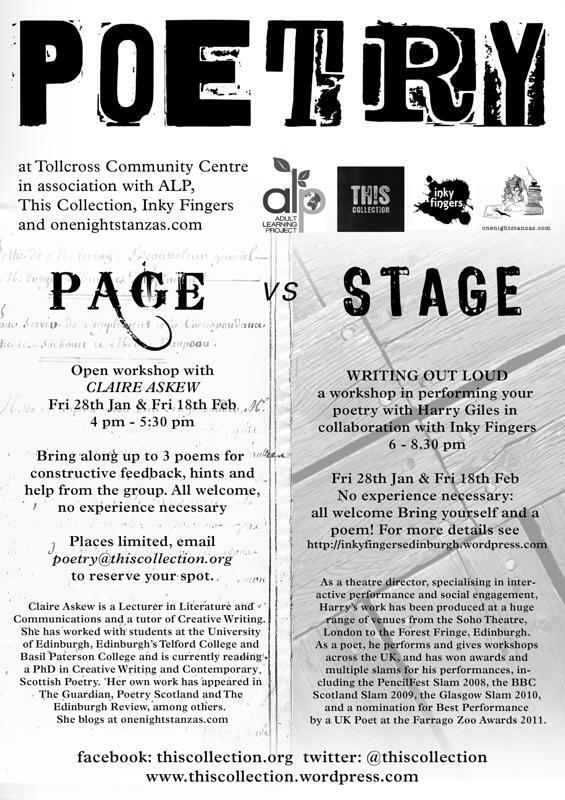 An open poetry workshop with Claire Askew, poet, Editor in Chief of Read This Magazine, Lecturer in Literature and Communications at Edinburgh’s Telford College and Tutor in Creative Writing at the University of Edinburgh. Bring up to three poems for discussion, s feedback, hints and tips from a small and friendly group. All welcome — no prior workshopping experience necessary! Interested? Places are limited so please email poetry@thiscollection.org to reserve your spot! Stick around after Claire’s page workshop and find out how to adapt one of your poems for the stage. Alternatively, come along fresh and learn all about the finer points of performance. Hosted by Harry Giles, writer, theatre director, founder and co-ordinator of Inky Fingers and multiple-award-winning slam poet. All welcome, no experience necessary — just bring yourself, and a poem!